We’ve just hit a year of sending out Rue Morgue Coffin Boxes, and it has been one of the most exciting years for Rue Morgue and HorrorPack. We’ve commissioned some really great T-shirt and Pin designs, found a lot of cool and unusual horror items to send to you, and sent some amazing editions of Rue Morgue Magazine and HorrorPack Blu-rays. We’ve also learned a lot about merchandising, licensing, and boring stuff like logistics management and international payments. It’s been a blast, but after a lot of thought and consideration, we’ve decided the time has come to end Rue Morgue’s Coffin Box. We’ll finish out by shipping the March box, and we think it’s one of the best ones we have put together. Shipping costs and logistics were a huge problem. Like most subscription boxes, we subsidize shipping… often by a large amount. We’ve had a number of problems with DHL and we’ve been actively looking for another shipping provider. We thought USPS might fill that role for us, but the USPS rate increases at the start of this year really had a negative impact on that plan. Additionally, the quality of horror products we could supply at $19.99 for 4 to 5 items also proved difficult. We did everything we could to bring you the best value and selection, and while we are happy and stand by our selections for each box, we could not please everyone. We’ve spent a lot of time on this, and we don’t feel like we can continue to deliver the quality of box we want to at that price point, and we don’t want to raise prices on our customers. For our current Coffin Box subscribers, there is nothing you need to do. You will NOT BE CHARGED again. All subscriptions have been canceled and will not auto-renew. We hope you will continue on with a subscription to Rue Morgue Magazine (see below), and/or choose to subscribe to a DVD or Blu-ray HorrorPack Subscription. Coffin Box may be gone, but you can still get a regular dose of horror by subscribing to Rue Morgue! 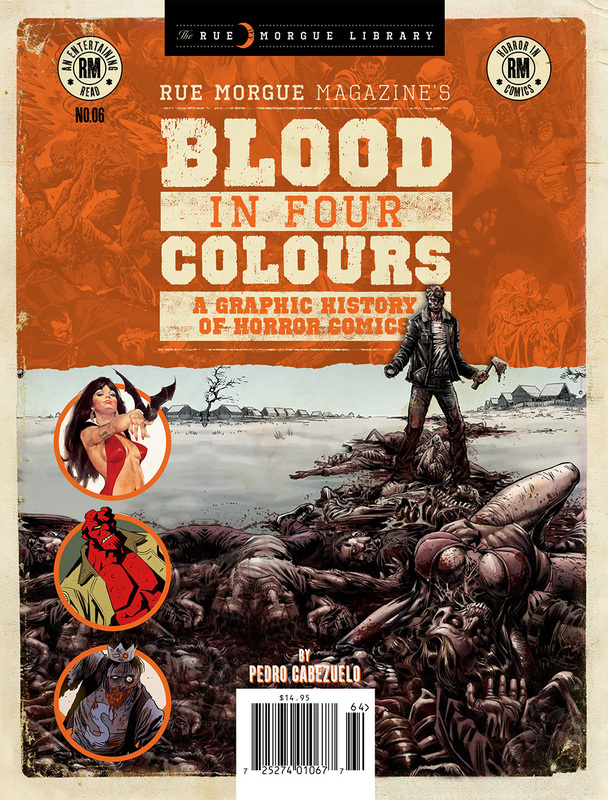 Only Coffin Box subscribers will receive 13% OFF with a six or twelve issue subscription to Rue Morgue magazine along with a FREE copy of Blood in Four Colours: A Graphic History of Horror Comics! To redeem this one time, exclusive offer, please use the promo code CB19 when filling out your subscription details! For HorrorPack, we have some new things coming very soon, including the occasional “HorrorPack Presents” title making an appearance in our Blu-ray pack and the return of Limited Editions in our DVD pack. Rue Morgue also has several exciting things as well, notably the upcoming release of Blood on Black Wax: Horror Soundtracks on Vinyl book, the 2019 Frightmare in the Falls Horror Expo coming to Niagara Falls in October and, of course, a brand new issue of the magazine every two months. We want to thank all of our customers (both Rue Morgue and HorrorPack) for their support of this endeavor and we look forward to bringing the best in Horror to you in the future. Don’t let your love of horror lapse. Subscribe to Rue Morgue! I just received the email that my subscription had been canceled and never received my first box(I paid March 11th.) Will I be receiving a full refund or will I be receiving a March box since my money was held for nearly a month? Hi Lisa sorry to hear you did not receive your first box! You should be receiving an email from HorrorPack soon with answers to your questions.